Giovanni Baptista Pergolesi (1710-1736) lived a short life and did not leave us a huge body of works. One that was destined to be forgotten for hundreds of years is the Septem verba a Christo (Seven Last Words of Christ), manuscripts of which were discovered from various monasteries and in various states of incompleteness between 1888 and the discovery by Hermann Scherchen of a set of complete parts in the 1950s. A new critical edition of the work has recently been published and the Akademie für Alte Musik Berlin under René Jacobs has newly recorded the definitive version, just out this month (Harmonia Mundi 902155). The performance runs a full 80 minutes and if you listen even just once you know that a major Baroque masterpiece has finally been fully realized. 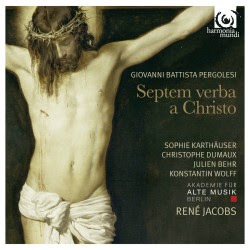 This is a mature, very lyrical and gravely dramatic work, with vocal parts for Soprano (Sophie Karthäuser), Countertenor (Christophe Dumaux), Tenor (Julien Behr), and Bass (in the role of Christ) (Konstantin Wolff). A period orchestra of trumpet, two horns, harp, strings, and basso continuo are called for as well. Jacobs, the soloists and the Akademie für Alte Musik Berlin give us a glorious reading, with the attention to period detail we have come to expect from the ensemble and for this work an especially dramatic brio. It is a very moving experience to hear this forgotten gem in its full-flowered version. The music is outstanding and will undoubtedly give joy to all who appreciate the era. Highly recommended. Edward Elgar has a rather undeserved reputation as a stuffy composer. The obvious "Pomp and Circumstances" and high-school graduations of course come to mind, but there is much more to him than that. Listen to his "Dream of Gerontius," his symphonies, and you will get a different picture. He of course was England's first important modern-day composer, a Romantic who wrote worthwhile music and the man who made possible the Anglo Renaissance of Vaughn-Williams, Tippet, Britten and the rest. Today we look at a recent volume of lesser-known orchestral works that came about as his reaction to the multivalent bleakness of World War I. 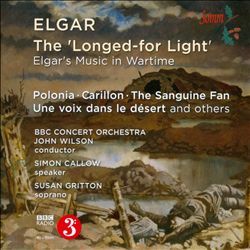 The Longed-for Light (Somm 247) covers nine works of short-to-medium length, each sufficient within itself but providing a cohesive program when taken in tandem. John Wilson conducts the BBC Concert Orchestra in honest, resplendent readings of the works, some of which include a soprano part well-sung by Susan Gritton, some which incorporate the wartime poetry of Belgium resident Emile Cammaerts, that highlight speaker/orator Simon Callow in the dramatic role. These are works not just of stirring feelings, of steeled resignation (there are a few where that is out-front) but also of sorrow, regret and introspection. Throughout Elgar's soaring lyricism and orchestrational prowess is well on display. John Wilson's versions are completely idiomatic and movingly captivating. This may not be the first Elgar you should get, but it is a welcome addition to anyone who wishes to know the composer in greater depth. And in a time when the wars seem never-ending, it provides suitable music for rumination. 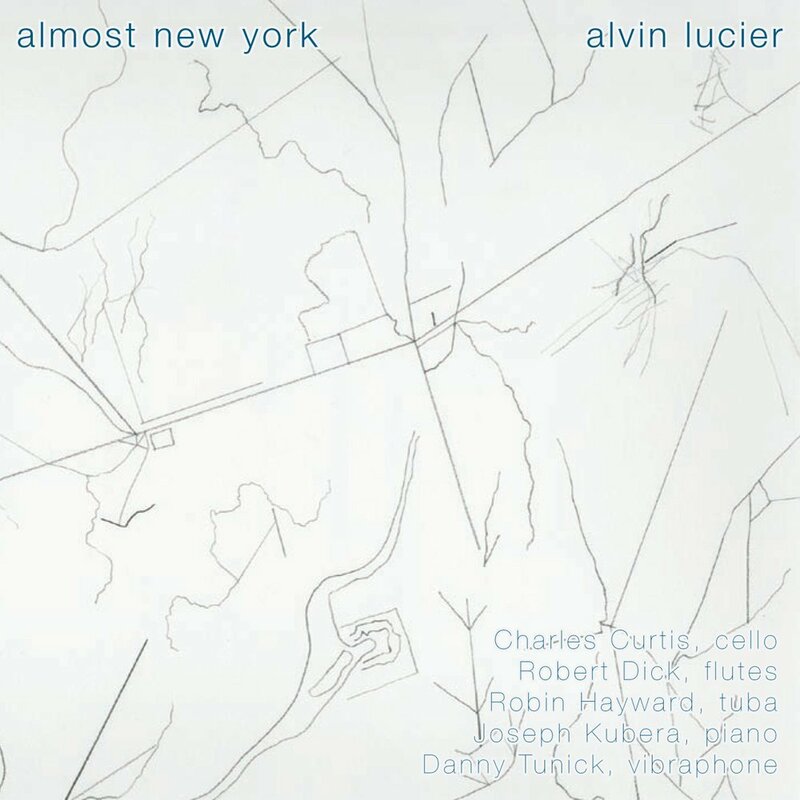 What I wrote in yesterday's blog about diatonic asymmetry/ritual melodics holds true for today's album of music by Alvin Lucier, Almost New York (Pogus 21057-2). On a 2-CD set there are four instrumental chamber works. Disk 1 has "Twonings" for cello and piano, the title piece for multiple flutes, and "Broken Line" for flute, vibraphone and piano. The second disk is occupied by a seven-part composition for tuba solo, "Coda Variations." Alvin Lucier's mature instrumental compositions tend to be deceptively simple. On repeated hearings music that seems at first based on somewhat slender means opens up and you begin to focus on the sheer acoustic properties of the tones. "Twonings" (2006) consists of unison notes played in equal temperament on piano, with the same notes played as harmonics in just intonation on cello. The music is in the form of whole notes, i.e. fairly long tones, in particular diatonic sequences (asymmetric) and occasional added chromatic tones. The difference in tunings of the two instruments causes pulsings, beatings and other fascinating acoustic resonances. It is a sort of ritual music--simple on the surface, inwardly complex as psychological listening experience. 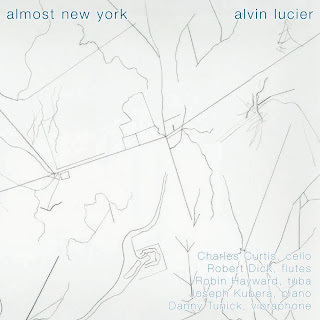 "Almost New York" (2001) features five flutes played by one player. Two sine wave oscillators slowly sweep the sonic spectrum while the flautist plays long single notes to complement various places in the oscillator's path--on contrabass, bass, alto, flute and piccolo in turn. In is a simple landscape yet holds forth for the sympathetic listener the more he or she listens. "Broken Line"(2006) pits flute glissandi against long-toned fixed pitches on piano and vibraphone. The flute audibly beats against the fixed pitches as it nears or strays from concert tones. "Coda Variation" (2005) is for six-valve tuba in just intonation. Eight tones, derived from Morton Feldman's "Durations 3," are subject to numerous permutations, tunings microtonally above or below concert pitch by a specific degree. The long notes expand your sense of pitch by slowly unfolding, revealing the world of pitches between pitches. All the pieces need to be heard with concentration, to allow the subtleties and ritualized simple-complex expansiveness to show itself. The instrumentalists are an object in focused execution. In the end you enter a compositional world that is Lucier's own, unrelenting in its ritual sensuousness yet austere matter-of-factness. Some may find the insistent suchness of this music off-putting. Others will ultimately bask in its forthright presence. An important example of Lucier's later work. If you are game, receptive to the premises, the set offers rewards like few other musics do. It's probably not for those that seek exciting, quickly satisfying mercurial sounds! Like watching a pot boil, patience is necessary for these works. Intent concentration opens up universes for the serious listener. There's been something happening in contemporary music that I find interesting. So bear with me while I cover some ground. And pardon the simplification. Go back if you will in your head to older forms, chants that involve ritual--I mean Gregorian and Ambrosian Chants, Byzantine Chants, Vedic Chant out of India, Jewish Cantorial Liturgy, Islamic Koran chanting. For the most part these forms of music (not always called music) are based on sacred texts that are not primarily symmetric; they are not treated in the form of metered poems. The music is usually diatonic (based on major or minor scales) and/or modal (based on particular beginning points within that scale). And by following a prose text the music does not assume a periodic symmetrical set of verses or stanzas so much as unfolds with asymmetry. In that way the chant is not in a song form. The notes have a logic but not an easily assimilated singability. It is no accident that your mailman does not whistle Gregorian Chant when he delivers your mail. Aside from the rarefied world such chants occupy, and the supreme importance of sacred text for them, they do not have the easily assimilated symmetry of a "Yankee Doodle." They may not be amenable to thinking in terms of bar lines and regular recurring groupings. Meanwhile in the secular worlds outside of chant, song form mostly prevailed, with pulsatingly metered poems set to music and the recurrence then of symmetrical verse and chorus forms. This in turn you might trace through the history of classical music, in the logic of sonata form, etc. Asymmetry still survived too, in later sacred music, fantasias, developmental passages, etc. This is not the place for that discussion. Some of the music we experience today tends more towards chant than song form. Of course Rap/Hip Hop can be that. And in the classical world a diatonic asymmetry became part of some of Satie's music--think of parts of his Furniture Music and some of the piano pieces. They don't always have song-like periodicity and they often are diatonic. John Cage throughout his life rebelled against periodic song form and created at certain points diatonic pieces that either directly imitated Satie or were put together by chance and for the most part followed an asymmetrical path. In both these cases the regular cadence of poem and the song form associated with it were put behind in favor of a melodicism that returned to the ritualized world of chant--though there ordinarily was no prose text behind the music. Flash forward to today and what's happening in some new age and minimalist classical music. In many ways minimalism and new age are miles apart, in that new age music can be today's equivalent of Furniture Music, Muzac and elevator music--music designed specifically NOT to be heard, to be background, to be non-consciously experienced. On the other hand minimalist composers expect to be listened to. Nonetheless both musics can have the tendency toward a ritual, asymmetrical diatonic melodic structure. At the same time, in both musics what was ordinarily the background accompaniment in song form often becomes the subject: the patterns of figuration, the non-song melody elements come to the fore. In this way we experience a heightened sense of time passing, of rhythm. OK, then what about African and Indian musics? Don't they also do that at least in part? Yes, that's true of both musics sometimes and perhaps their influence is in part responsible for developments taking place in new age and minimalism. 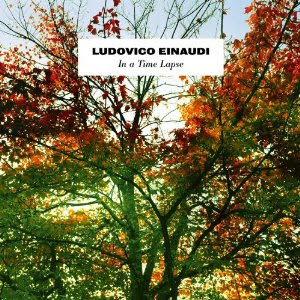 At any rate composer Ludovico Einaudi, in his orchestral-piano music for In A Time Lapse (Ponderosa) exemplifies the tendency on the new classical, minimalist side. Background is often foreground, melody is often of the asymmetrical diatonic sort, almost ritualized. Now the fact that it partakes of elements in common with new age music in this way means it is music that can be pleasantly ignored, though I can only assume the composer wishes to be listened to. And it brings your attention to time by putting the time element in the foreground. It does help explain the popularity of the music. If it is new age music it is very, very well written new age music. But it also bears scrutiny whereas much new age music does not, so it earns its place as a part of the minimal classical camp. There is repetition, there is often melodic non-directedness or asymmetry, there is a diatonic overall melodic tendency. It is music that CAN indeed be in the background for those who look to play music they do not listen to, but it is too good to ignore. Now that means, in my mind, that listening closely to this music is like attending closely to a ritual. That content becomes subsumed to present form. Like a chant, you experience it in a singular way and it does something to you--perhaps mesmerize is still the right word, but more than just getting you off in that way, it ritualizes your life in a world where ritual has diminished as a whole. The point ultimately is that this music bears listening to. He appears to be moving in a particular direction with minimalism, one of a number of developments, not always mutually compatible. Let me save that discussion for another day. Giovanni Pierluigi da Palestrina, as you will probably remember if you took "History of Music" in college, did more for sacred polyphony in his day (1525?-1594) than anyone else, pretty much. In my earlier days that sent me scampering to get a few recordings, which back then invariably had the "old-lady vibrato" choir, or so my memory serves me to think, but usually could be found at a budget price. As performance practices changed over the years, the vibrato mostly is gone, and the choir, especially if it's The Sixteen under Harry Christophers, sounds heavenly. 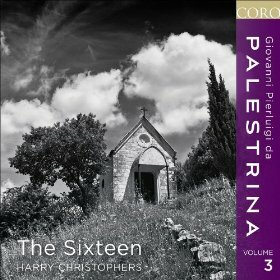 In fact I do have such a disk playing right now, with the Sixteen offering us Volume 3 of their Palestrina series (Coro 16106). Those who celebrate Easter according to the Roman calendar would be well-served by this volume, as indeed would those who want simply to hear wonderful music. You get 70 minutes of glorious choral polyphony, including "Three Offertories for the Easter Period," "Song of Songs: nos. 4-6," and "Missa Regina Caeli," among other things. The Sixteen and Palestrina seem made for each other. This is a very nifty volume and right on time. Recommended! 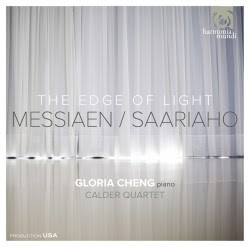 Pianist Gloria Cheng and the Calder Quartet embark on a interesting program divided between early mature piano & chamber works by Messiaen and the piano/chamber music of Kaija Saariaho. Messiaen's "Huit Preludes" and the relatively brief "Pièce pour piano et quatuor à cordes" get sensitive, rhapsodically concentrated readings by Ms. Cheng and the Quartet. These bear the unmistakable composing hand of the master, but tend to a bit more romantic and a tad less rhythmically advanced than his later work, the piano preludes especially, but they are charming and very good to have. The performances are all you could ask. Kaija Saariaho, who is among our living exponents of modern music, gets to be heard in the second half of the program with her "Prelude" and "Ballade" for piano, modern and flowingly rubato in a post-Scriabin zone, and the chamber work "Je sens un deuxième coeur" in five parts. The latter work has mystery and in turn a dark sort of lyric ponderousness, agitation and motor excitement, a balladic broodingness, and a dynamic expressiveness, all in expanded tonal territory. It's a very personal modernism on display. On its basis we have someone to reckon with, a composer of consequence. In the end the Messiaen and the Saariaho balance each other well, both with a searching quality but very much in their own ways. Cheng and the Calder Quartet play the music like they were born to it. Anyone who favors the advanced and the deeper sorts of modernist music will find this release much to their liking. 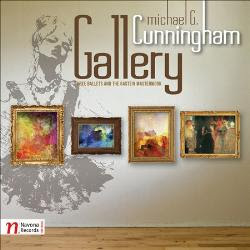 It is a compelling and tightly arrayed fit of artists, composers and works. 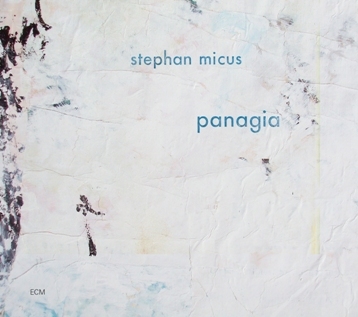 The strains of early music are never far from earshot on Stephan Micus's latest album, Panagia (ECM B0018009-02). In fact ancient choral strains, plainchant, Orthodox chant, organum and middle-ages modality are inherent in what he is doing. It's Maestro Micus in his 20th album for ECM, celebrating his 60th birthday, in a setting to music of six Byzantine Greek prayers to the Virgin Mary. He uses his vocals in multiple tracks to create choirs of archaic beauty, or singly to launch into song. He plays for this recording an exotic array of instruments, including the Bavarian zither, dilruba, chitrali sitar, sattar, 14-string guitar and nay. There can be ensemble sounds or just single accompanying instruments. Whatever the mix, it is stunning music, early-new music for today, composed today, performed today, but ultimately timeless. Dmitri Shostakovich composed music under circumstances not always ideal. And his music reflected some of that, one way or another. The late Cello Concerto No. 1, for example, from 1959, is a brilliant work with much passion and most definitely a sarcastic, sardonic edge to it. He had clashed over the years with Stalin and his social realists, most notably after Stalin heard and denounced Shostakovich's Lady Macbeth opera. The Sonata for Cello, op. 40 was a product of the earlier days, written in 1934, when the troubles were about to begin. It is no less a masterpiece. In the end we listen. We brush all these things aside, for after all modern music can be heard to contain all manner of attitudes but primarily projects musical values that work together or not according to whatever standard we might apply. 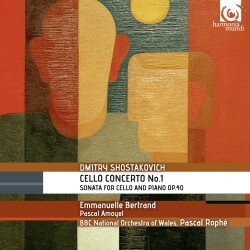 And so we find today the two brilliant works for cello contained in a nicely performed program (Harmonia Mundi 90214). Emmanuelle Bertrand handles the solo cello part for both pieces, and does so in a less emotionally romantic manner than some earlier principals have, which I think allows a better balance between the elements of each work, and perhaps better suits the expressive nature of these works. The BBC National Orchestra of Wales under Pascal Rophe give the concerto a spin that fits Bertrand's reading. It gives expressive weight where needed but a kind of well-balanced, musical treatment prevails. The same can be said of pianist Pascal Amoyel in the sonata. All told this is a fine set of performances that bring out the brilliance of Shostakovich. His complex personality and the complex world in which he thrived all play a part in the music, but a Shostakovich for today should let the music ring through, for it is brilliant. This recording does that well. 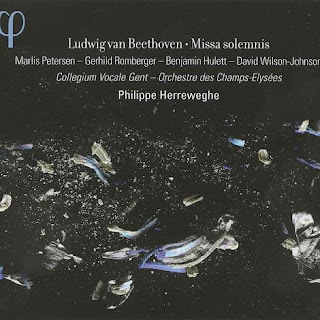 Many years ago for one reason or other I nabbed tickets to hear Beethoven's Missa Solemnis sung by a very reputable choral organization. I asked somebody I knew slightly to join me. It was a last-minute thing but she accepted. So we went. Afterwards I was eager to know what she thought, since I was single and determined to end up with somebody that appreciated good music. "So, did you like it?" I asked. "No," she replied disarmingly, "I didn't." She didn't. I thought to myself. Then I thought a bit more. Come to think of it, I didn't like it much, either. We went our separate ways. That was that. But for many years I listened to various versions of the work and never could quite get with it. Of all of Beethoven's mature masterworks, it has proved most difficult for me to get into. Why? The answer came to me as I first started listening to a new recording of the work by Philippe Herreweghe, conducting the Collegium Vocale Gent and the Orchestra des Champs Elysees (Outhere 007). It takes a visionary performance to allow the work to breathe. Transparent. Passionate. Herreweghe and company give us that, an "Ode to Joy" sort of version, ecstatic, enthusiastic, articulate. I've heard and still have some rather famous older recordings and they never convinced me. Perhaps it was that they were a little too solemn. There is such a thing. Even the funeral movement of the Eroica Symphony soars in the best hands. So should the Solemnis Mass. The Collegium Vocale/Herreweghe version does that. It soars aloft, with beautiful synchronicity of soloists, choir and orchestra. If you have loved Beethoven but never seemed to get with the Solemnis, this version may do for you what it did for me. It is quite stirring! There are works that fuse genres and sound great, that grow organically out of the compositional setting and thrive as singular examples of music today, and there are those that fuse elements in various ways but remain merely interesting. Mary Ellen Childs' Wreck (Innova 844) ranks in the first category. Wreck was written for a work by Carl Flink's Black Label Movement dance company. It portrays the last hours of the victims of a shipwreck, trapped, yet momentarily saved by being in a water-tight compartment of a sunken boat. The music is written and performed for a chamber group of clarinet, violin, two cellos and drum set/percussion. The work has 18 short, interrelated movements that show a minimalist slant much of the time. When the drum set is playing in the ensemble there is a propulsion that gives it a jazz-rock/prog veneer that is quite attractive and memorable. The other movements range from ostinato-based to atmospherically soundscaped. There is development and the incorporation of avant elements. It all no doubt suits the dramatic dance story as it unfolds. What's important to those listening to the audio recording is that the music is very contemporary and convincing. It has a sound and melodic dynamic that sets it apart and should find favor with adventure-rock listeners as well as contemporary classical aficionados. In that way it is like some of the best Bang-on-a-Can works of the last decade. The performances are very good, excellent in fact. 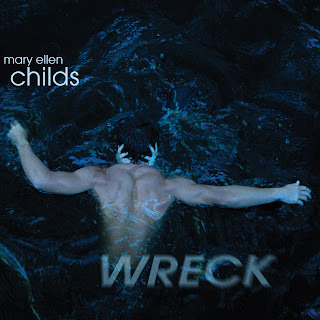 Mary Ellen Childs has talent and originality. Recommended. There are some albums that are just so unusual that not only is there no convenient peg to hang them on, the music absolutely refuses to be pegged at all. 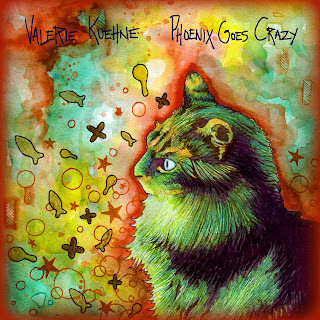 Valerie Kuehne's Dream Zoo EP Phoenix Goes Crazy (Self Released) is most definitely such. It's a gathering of b-sides, obscurities and unreleased material. Valerie commands attention on cello, vocals and composition-concepts, with the effective collaboration of Dream Zoo chamber-improv participants in varying strength of numbers depending on the piece. The music singularly combines aspects of new music/classical, improvisation, song form and a hint of rock, all with an avant slant. Some are story songs, some are overtly funny, some off color, some give you a big horse-laugh, all are unpredictable. The songs to me have the most tensile strength of all the material. Her eccentric vocals are one-of-a-kind and inimitable. I also liked the free-gypsy chamber piece and perked up at her at times rather intense cello expressions. Most certainly they complement well her over-the-top, lieder-gone-wild dramatics. There's a story set to musical accompaniment about an abusive clown that will make you laugh. There is also a group dialog number that involves collaged discussions of what members might want to eat for their "last supper." That one does seem to go on a bit and tends more toward the extra-musical than the musical. Like a comedy routine, there is a saturation point after which the hearing of it provides diminishing returns. But of course since it's the last number it can easily be played or not in future hearings. The rest is an extension of the last album (see February 20, 2012 posting on this blog)--original, wacky, downtown, shredded romantic excess proffered with a great good humor. The dialog piece lasts 13 minutes. The remaining material gives you a good album side of Valerie's unusual musically focused post-mannerisms. There's no mistaking this music for another. It's very original--so much so that some might be put off. Avantists and those who like outside-the-center lunchables with unexpected ingredients will get something good of it, as I did. You can find out more and grab a download at http://dreamzoo.bandcamp.com/. When something works for you musically, it emanates with a feeling of inner satisfaction. Some folks just affirm that feeling and go on. Reviewers have to ask themselves why. 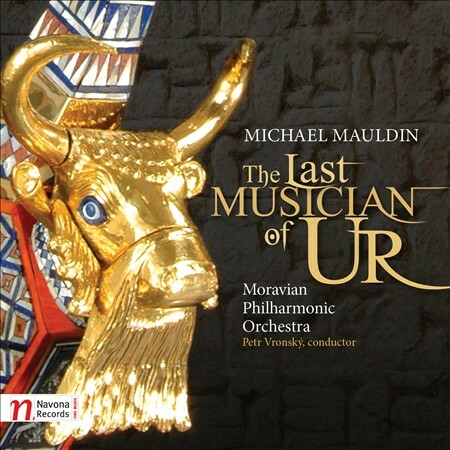 The satisfaction in my case is about Michael Mauldin's The Last Musician of UR (Navona 5891), as performed by the Moravian Philharmonic under Petr Vronsky. It's a seven-minute work and the disk that results is a CD single of short duration. There's a back story to the music. Ten years ago looters damaged the Gold Lyre of UR, said to be the oldest stringed instrument extant, while plummeting the Iraq Museum in Baghdad. Andrew Lowings, an English harpist, set about to recreate a working version. Mauldin's orchestral work was composed with this harp in mind. He sets about imagining the last-ever harpist of UR and what he might have played, what he might have thought. The ensuing orchestral work has, understandably, a prominent harp part which is quite lovely. The work itself is in the best sort of "tonal exotica" mode. One of the impressionists might have written it--or Hovhaness, even more so. It's a beautiful little work. The list price on this baby is $2.99 and I think you'll find it well worth your coinage for the pleasure it brings. Mauldin did something you should hear! ECM was instrumental in many ways from the beginning of the '70s on in fostering a music that had a particular identity. The music that fitted into this category tended to be mellow, spacious, tonally direct and generally less aggressive than the more overtly avant jazz being made during the '60s and '70s. One of the side effects of their all-embracing presence among the music world is that they inadvertantly spawned a rather vapid, principally watered-down category of music known as New Age. ECM dealt in artists, composers and improvisors of a high caliber; New Age was home to eager but less artistically adept musicians for the most part. The results were a kind of new middle-of-the-road sound for aging hippies that was not usually very contentful musically. Undaunted, as time went on ECM continued to produce high quality music. It began turning in addition to their brand of jazz, modern and early classical composers, especially those who favored an ambiance that complemented the sort of jazz ECM was known for. The ECM New Series was the outcome of this endeavor and it's been producing some wonderful recordings, generally speaking, ever since. One of the artists that became associated with the label at that time was Greek composer Eleni Karaindrou. She created music that was very accessible, melodic, lyric, spatially encompassing and sounded well in the ambient ECM production style. 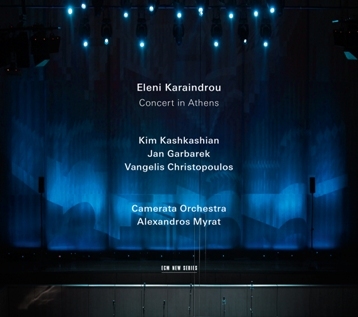 Flash forward to today and her 10th release for the label, Concert in Athens (ECM New Series). 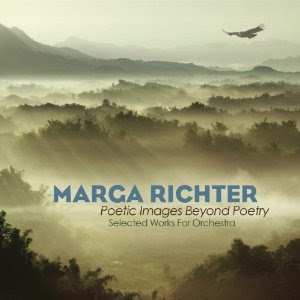 It is in some ways a retrospective affair with reprises of the film scores "The Beekeeper" (with Jan Garbarek on tenor solo) and "Ulyssey's Gaze," featuring violist Kim Kashkashian. But it combines old familiar works with others not yet available on disk, with an emphasis on music for the theater. The Camerata Friends of Music Orchestra under Alexandros Myrat take on the task of executing the scores with imagination and a lush, resonant spirit. Karaindrou is well served by the concert performance and the listener gets a very good sampling of her style. It is ravishing music that will charm those who respond to music that caresses the weary soul. Compared to an Arvo Part this is music that has more of a featherweight gossamered romantic quality much of the time. It is not inclined to a profound seriousness so much as it soars in rhapsodic effulgence. It is ECM music in many ways, ideally suited to Manfred Eichner's sonic landscaping. If you do not know her music, this is a very good place to start. Logical sequence, resurgence or mere serendipity can bring a composer into your listening life. In the case of Grazyna Bacewicz (1909-1967) there were several years in the '90s when I was privy to a press pass for the New York Philharmonic season under Kurt Masur, since I covered much of what was going on at Lincoln Center for a Delta Air Lines publication. I suppose that Bacewicz's music at the time was enjoying more exposure among audiences than previously here in the States but it was pure chance that her music appeared on the program I attended one Sunday afternoon. I perked up at the performance, being in general a follower of the Polish and Eastern European symphonic modern situation. The piece impressed me. One thing led to another and I found myself seeking out more of her music. Fifteen years later and the seeking continues. So today we have a CD of her two Cello Concertos (Dux 0591), along with a brief Overture from 1943 to fill out the disk and prefigure the music to follow. The Polish Sinfonia Luventus Orchestra performs decently throughout the entire disk. The two concertos are separated pretty widely in time and style. The first comes out of 1951 and is in a kind of eastern neo-classicist, rather exuberant modernism. For this work Adam Krzeszowiec is the capable soloist, George Tchitchinadze conducts. It is a work of charm and persuasive straightforwardness, with the allegro finale having a lilting jauntiness that readily grabs one. For the second concerto we move in time and style to 1963. This is full-fledged modernism with dramatic sturm und drang cello that Lutoslawski and Penderecki would have appreciated. 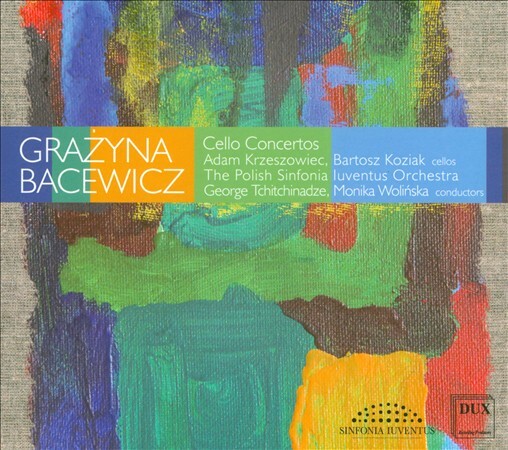 Bartosz Koziac takes on the dynamic, difficult part with heroic bravado; Monika Wolinska conducts and inspires an authoritative, passionate precision from the orchestra. Of the two works, the second is a fair deal more enchanting and singular. By then she had found a voice and expressed a deeper range of feelings and ideas. It's high modernism with her own spin. The earlier work is engaging and good listening, but it is not quite as profound as the second concerto, nor was it meant to be. Put the two together with these quite respectable, seriously competitive performances and you have a very good introduction to Bacewicz's music over time. If you are like me it will give you the impulse to explore the rest of her opus. She does not disappoint, I've found. Recommended. In the past 100 years we have seen the rise of percussion instruments as equal contenders for musical attention in contemporary classical music. No longer do the strings, winds, and brass have a monopoly on musical eloquence. Of course the piano has been a critical instrument since its beginnings. But nowadays percussion ensembles, large percussion sections in orchestras and solo percussion works have become relatively frequent occurrences. 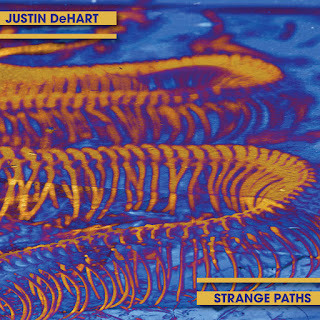 It is to the latter of the three possibilities that we turn today, to percussionist Justin DeHart's solo percussion recital disk, Strange Paths (Innova 849). Four works are featured, each with its own sound and way of proceeding. Michael Gordon's "XV" (1998) features a set of tuned tom toms sounded in a series of contrasting velocities occurring simultaneously, weaving in and out of the matrix, and receiving accents intermittently to bring forward a given tom tone and velocity. It's an exercise in polyrhythmic density but in an ever-evolving steady-state that has minimalist overall coverage more than an African central fulcrum tempo. Partially because of the nature of the sound of the toms but also because of the tendency for patterns to interlock, it is in the lineage of Steve Reich seminal work Drumming, though a distant and autonomous relative, so to say. Iannis Xenakis's "Psappha" (1975) makes pulsating but very much more differentiated use of toms and a bass drum, and what sounds like an African xylophone. As with many of Xenakis's works, there are zones of varying motives (and timbre families) that enter and exit periodically, in this case evolving into an ever more sparsely populated universe. Bell-tree chimes and other resonant metallic objects make their appearance towards the end, at the same time the dynamics and density change back to a more urgent and populous soundscape, concluding with a relatively climactic thrust of sound. This is bracing music! Brian Ferneyhough's "Bone Alphabet" (1992) apparently follows with the same instrumentation and a different, more expressively accentuated overall series of many timbred phrases, becoming something like a linear piece for prepared piano, only each sound of course gets generated by either a separate instrument or pitch of an instrument. There are choices to be made by the soloist at every turn, so that every performance will sound differently. This one sounds very good indeed. The recital concludes with a four-part work for vibraphone, Stuart Saunders Smith's "They Looked Like Strangers" (2009). It is a complex melodically-harmonically rich piece that has an improvisational/fantasia sort of feel to it. It is not an easy piece to play in parts; it has a piano-solo-like feel to it in terms of phrasing and trajectory. This work to me though quite pleasant to hear, is of lesser interest than the more dynamic preceding works. But perhaps that is only to say that it demands more of your undivided attention and requires a greater attentiveness to the various musico-syntactic continuities. The vibes have developed such a strong tradition in modern jazz that I might be a little spoiled by some of the innovating improvisers active and/or admired today, from Bobby Hutcherson on. Nevertheless this is music that has its say and does have something to say. 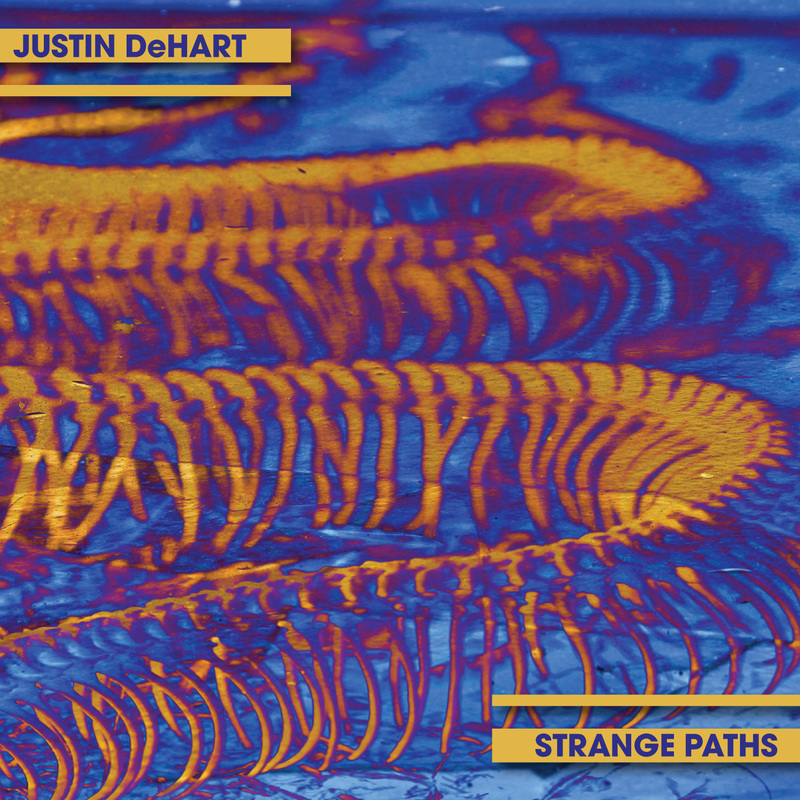 In the end Maestro DeHart shows great musicality, technical ability and a devotion to realizing each work with care and dramatic verve. It is a varied program that encapsulates the tendencies in solo percussion from the '70s onwards. It is also a most interesting and rewarding listen. Our assumptions about length and flow in music, like other everyday assumptions, usually only become obvious when challenged. So Wagner's Ring Cycle occupies so much time if performed as a whole, an audience may need to bring toothbrushes and pj's. On the other end is the short work. Michel Lambert, composer-instrumentalist with a singular vision, wrote an ultra short symphonic work nearly every day for 92 days, between January 1st and July 1st, 1988. Some last only several seconds, a few 2-3 minutes, and most are somewhere in between. They are meant to be performed one after another with only a brief pause in between each. In the version at hand Journal des Episodes (Rant 1244) we have a few realized for symphony orchestra and the rest taken on by a jazz piano trio of Lambert (drums), Alexandre Grogg (piano) and Guillame Bouchard (contrabass). The juxtaposition of modern classical motives and piano jazz performance puts the musical sequence in an interesting no-man's land of new music-jazz moderne. The trio is given leeway and improvisation enters the picture in one way or another throughout, which is fitting and sounds right. The brief pieces, especially after you've heard the CD a few times, flow together in ways that begin to create a matrix of musical ideas in constant flux yet coming together as a whole in lived experience. The motifs can be abstract or more forwardly song-like depending on the piano trio's interpretation, which by the way is very creative and multi-valent stylistically. The combination of unusual score, symphonic appearances and piano trio interpretation makes for an intriguing, at times uncanny listening session. Somehow after a few times through the whole thing gives you a kind of satisfaction that you might get from a meal at a tapas bar, with well crafted mini-appetizers succeeding one another in rapid succession until you feel you've traveled pretty far, culinarily speaking, and that the trip was worth the effort. So with Journal des Episodes. It's somehow very serious fun to jump from piece to piece. The trio is creative about it all and there is something to be creative about, after all. Back when the world was younger and there were no CDs, downloads, wax cylinders or 33.3 RPM LPs, new music had to be heard in person, imagined/constructed in the mind or on the keyboard while examining a score, or dreamed about in some nether world we may never reach. Today it's much easier but that means in my case there may be 30 new composers, new works or at least new performances that reach my desk every week and it's up to me to decide what to cover and then what to say. I am not complaining. It is a position that has its privileges but at the moment no tangible rewards. Still it gives me the chance to hear much music and that brings me joy. Today, for example, we have the composer Michael G. Cunningham and four of his orchestral works on the CD Gallery: Three Ballets and the Gastein Masterwork (Navona 5893). What we have are quite reasonable run-throughs of works that have both movement and matter, substance and rhythmic propulsion. The three ballets, "Nyadina," "She" and "Chrysalis at Mardi Gras," have a kind of post-Stravinskian choreographability. They are modern sounding without entering avant garde territory, rich in musical imagery and good listening. The final work in the program, "Gastein Masterwork," reaches in many ways that nether world of musical imagination that I alluded to earlier. It's termed in the press sheet that came with the CD "a 'prediction' of Schubert's lost work." And as such gives us a four-movement work in the classical Schubertian idiom, with a definite charm and forthright straightforwardness that Schubert himself might find appealing. That in a nutshell is the music of Michael G. Cunningham as heard on the disk. He is a talent and the music is quite enjoyable. 2013 marks the 400th anniversary of Gesualdo's death. To commemorate the anniversary we can expect a number of new recordings and performances throughout the world. Certainly the most notable to date is the Vocalconsort Berlin's recorded edition of the Sacrae Cantiones Liber secundus (Harmonia Mundi 902123). These ravishing motets in six or seven parts have for many centuries been missing the bassus and sextus parts. James Wood spent three years reconstructing the parts so we can at last hear the full sonance of the Second Book for the first time. The Vocalconsort Berlin obliges with a sparkling performance that all who love Gesualdo will certainly take to heart. Those looking for dissonances galore will not find that as much in this series of works, but they will find the characteristic chromatic forays at peak emotional moments and the general harmonic-melodic way with counterpoint that made Gesualdo the daringly original master he was and give the attentive listener a treasure trove of vocal beauty. 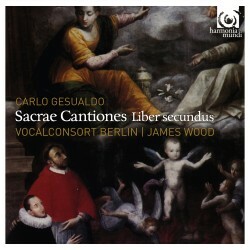 James Wood and Vocalconsort Berlin offer up to us a full 70 minutes of virtually new Gesualdo in excellent sound. This is a treat, and a milestone! Marga Richter, some time in the fifties, was off to a great start. A good number of her compositions were being recorded by the now long-defunct MGM Classical Records Division. Then what happened? All I know is that by the time I found many of those recordings in a used record store, she was a name I did not know at all. And yet the recordings showed a budding modern figure, a woman no less, with good ideas and a poetic sense of form. I was forced to sell most of those recordings before I moved to my present location, but I missed them almost immediately. Now we have an entire disk devoted to three orchestral works that date from the '70s, conducted by Gerard Schwarz, Poetic Images Beyond Poetry (Ravello 7867). They are the premiere recordings. And they show her mid-later period in a bright light. The compositions have a high level of expressivity, an easy familiarity with the orchestra and an even brilliance of orchestration. "Out of the Shadows and Solitude" has a kind of dash to it. "Quantum Quirks of a Quick Quaint Quark" is a short piece, which serves as a good prelude to the half-hour "Spectral Chimes/Enshrouded Hills", which is in many ways the centerpiece of the set. There is a very chromatic strain present in the works, especially the latter, where insistent minor second intervalic melodies form the central organizing motives. It's a somber music, expressively and orchestrationally almost neo-romantic but harmonically quite modern. I am sometimes reminded of the music of Allan Pettersson, whose scores often had a quality of angst, even despair. But Ms. Richter's own vision shines through her later music nonetheless. This is music of a very serious caste. It is broad and sweeping, very personal, and in its own way, brilliant. It sounds out the listeners today like a series of poems by Sylvia Plath or John Berryman, very articulate and very much of a complex mood. She is her own original self. Whether this is music you will like depends on what kind of person you are, I believe. There is a dark quality to it that stays in the mind long after the music has ended. She is a voice that should be heard. I hope this recording opens the way to more performances and recordings of her works. I am keen to hear them in any case. There is much still that remains unexplored in the creative output of Mieczyslaw Weinberg (1919-1996). We have out now, for example, the World Premier recording of his Symphony No 8 "Polish Flowers" (1964) (Naxos 8.572873), an ambitious score for full orchestra, choir (the Warsaw Philharmonic Orchestra and Choir) and soloists (Rafal Bartminski, tenor, Magdalena Dobrowolska, soprano, and Ewa Marciniec, alto) all for this recording under the direction of conductor Antoni Wit. The text uses passages from Julian Tuwim's epic poem "Polish Flowers" (hence the symphony's title) that express in somber terms some of Poland's tragic past and, at the time, uncertain future. Weinberg shades the symphony according to the subject matter and so this is one of his more dramatic scores, at times quite grim, other times hopeful, but always with a passion for his home country and its fate. It seems incredible, given the scope and impact of the work, that it has never before been recorded in its entirety. As a transplanted Polish Jew in the Soviet Union, Weinberg addressing such issues in a full symphonic context might not have been especially welcomed in those days, and that may in part explain the lack of a release at the time. But nearly 50 years is a long time to wait! Then too this is a work that puts (necessarily) such weight on the vocal/textual components of the work that it does not meet typical symphonic expectations. Perhaps it's more a dramatic oratorio than a symphony? No matter. Regardless there is enormous dramatic power in this work and that comes across very well in this recording. It is a cornerstone work from a composer we are only now getting to know systematically in the west. The Naxos edition is impeccably produced. I for one am quite glad it has been made available to us. Benjamin Britten on his 100th Centennial year, as one might have supposed, is receiving a goodly number of performances and recorded releases. Britten's choral writing was some of the most appealing and original that the past century had to offer. 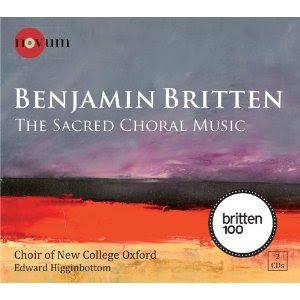 We are fortunate that for the occasion the impeccable Choir of New College Oxford under Edward Higgenbottom have recorded an encompassing 2-CD set of his Sacred Choral Music (Novum 1386). There are gems to be heard here in definitive contemporary versions: the "Hymn to St. Cecilia," the "Te Deum in C," "A Ceremony of Carols," "Rejoice in the Lamb," the "Missa Brevis," and other works besides. Britten of all composers in his day managed to inject life into sacred choral form while keeping just enough tradition in the music that there was continuity. This is glorious music, performed with conviction and style, in first-rate sound. It's a great way to celebrate Britten's 100th!